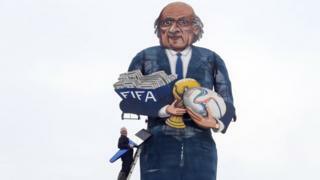 An effigy of Sepp Blatter has been selected to be burned as part of a Kent bonfire society's annual celebrations. The Fifa president is currently suspended from his position while he is being investigated over corruption allegations. Previous celebrity Guys have included Apprentice contestant Katie Hopkins, disgraced cyclist Lance Armstrong, and footballer Wayne Rooney. The Edenbridge Bonfire Society raises money for local charities. In 2014, an effigy of Jose Manuel Barroso, the outgoing president of the European Commission was burnt as part of the society's celebrations.